Never a dull moment over here. 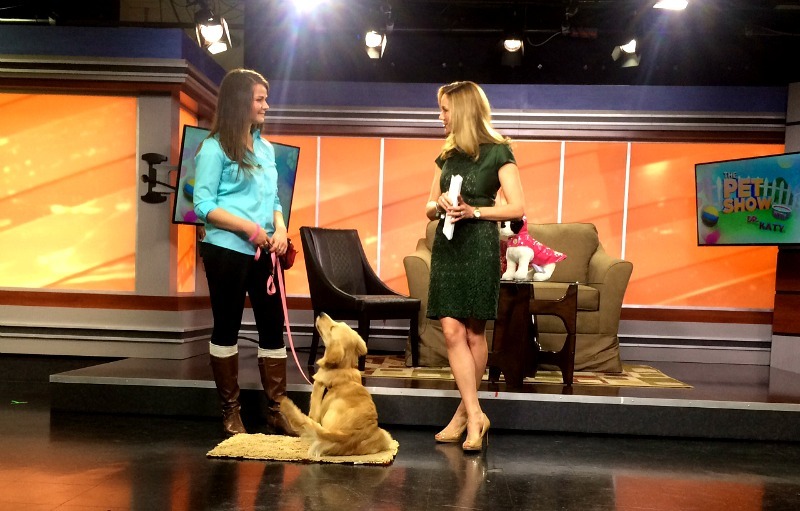 A few weeks ago I had the exciting opportunity to take positive training on TV! Being that my full time job is in marketing, I’ve been on TV plugging fundraising events a handful of times (the first time I hung out with Johnnie Cash was when I took her on the news to promote our annual gala!). This time was different though – I secured the gig myself on behalf of Dog Latin and decided the content for the five minute segment. I pitched a “Clicker Training 101” angle and I was so excited to use this opportunity to spread positive training to the masses. 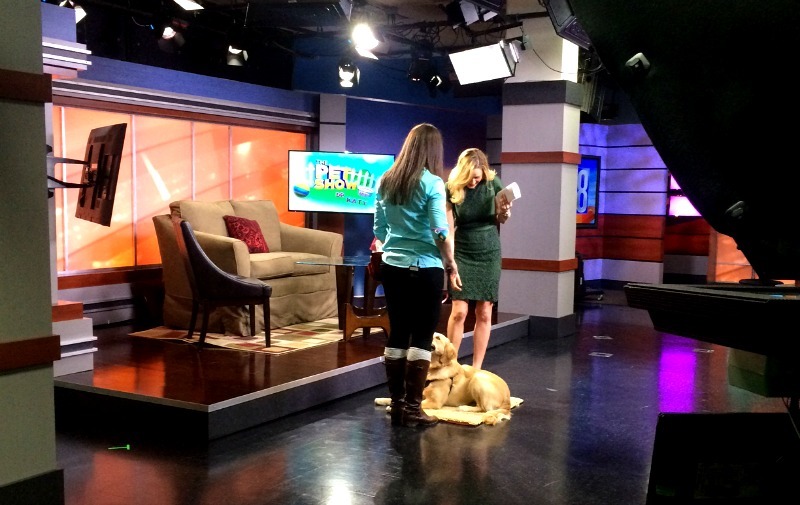 After I got confirmation that we had the segment, I realized I didn’t have a dog to come with me… oops. Minor detail, right? 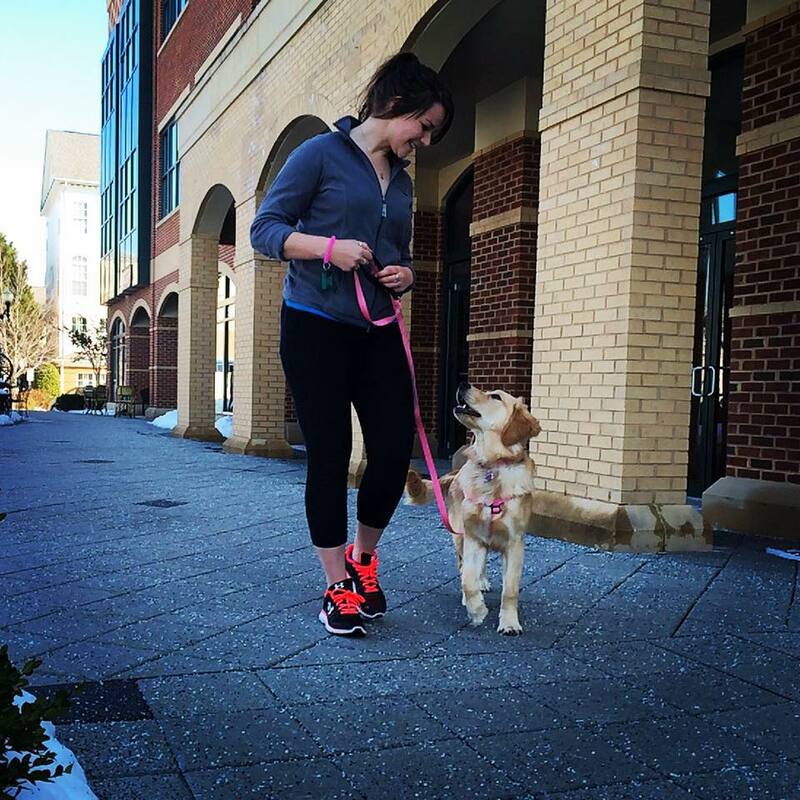 Luckily Dog Latin had just started working with this a-maz-ing client, a six-month old golden retriever named Scarlett. Despite being a young puppy, Scarlett was the absolutely perfect dog to bring with me to show off what clicker training can do. Her owner has been teaching her different manners, behaviors and tricks using the clicker since she was just eight weeks old! Not only does Scarlett have a large repertoire of behaviors, but her focus is unbeatable – especially for her age. To prepare for our taping, I took Scarlett out on the town to work around distractions. As I’m sure you know, your dog’s ability to respond to cues out in the “real world” is a whole different ballgame than in your living room! The last thing I wanted was for her to see the studio, the cameras and all the people and freak out or be unable to work. So we went to PetSmart and to outdoor town squares and I did my best to create challenging environments for focusing – and Scarlett rocked it each time. We went into our TV debut with a bangin’ reinforcement history. We were appearing on The Pet Show with Dr. Katy. I admire Dr. Katy because she’s so successful in what she does – helping the public with their pets – and she has a blast doing it. She also doesn’t compromise who she is just because she’s in the public eye. Her twitter handle reads, “Veterinarian, Mom, Writer, Rabid LSU Fan. Snarky stiletto loving country girl rockin’ the big city.” Love it, girl – you do you! Scarlett and I showed up to the studio armed with roughly one zillion hot dogs and pieces of cheddar cheese. I knew my reinforcer had to be a goooood one if I was going to keep her attention over the crazy sights and sounds of the news station. I was so relieved when she still had her sparkly, perfectly attentive face on at the studio. I was a little nervous, but once the cameras started rolling all of a sudden it became easy. As I settled in and started talking about training, I immediately relaxed. I had plenty to talk about – from switching to functional rewards, to how to get behaviors we like, to showing off Scarlett’s tricks – the five minute segment flew by. Scarlett did unbelievably well, and Dr. Katy was a gracious host. So, like I said, never a dull moment! I am so beyond thankful for this opportunity and the many lessons learned from the experience. I look forward to making next time (because there will be a next time!) even better. Technology wins again and I can’t figure out how to embed the video, so to watch the clip you have to head to the website. We start at about 8:10! 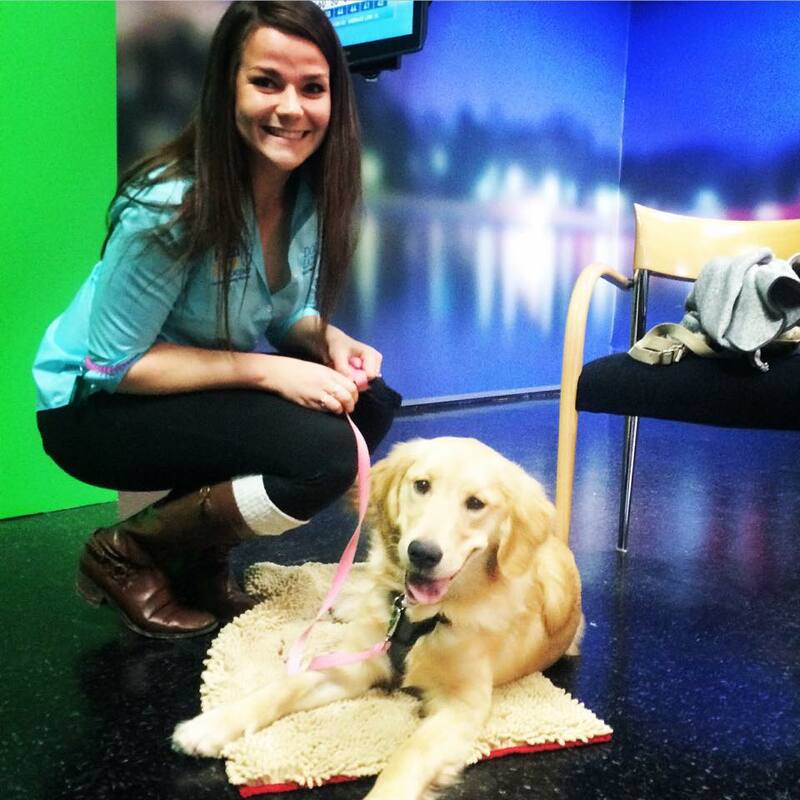 This entry was posted in Dog talk, Dog training and tagged clicker training, golden retriever, media, positive reinforcement, positive training, small screen debut, taking a dog on tv, training around distractions, tv. Bookmark the permalink. That was fabulous! And where I thought *you* rocked it best was when Dr. Katy asked if one had to have classes in order to accomplish clicker trainer, and you opened it up to EVERY dog owner who may have been intrigued by what she saw by saying, “No, it’s fairly easy and there are resources out there on our website and youtube.” Well done!! Way to get positive reinforcement out there. Woo-Hoo!